Safe Trade Coin (XSTC) aims to be a community-driven digital currency. In this article, we take a look at Safe Trade Coin’s technical features, future roadmap, and more. And, we try to assess whether or not Safe Trade Coin is safe to use. According to the project website, the Safe Trade Coin (XSTC) community plans to launch a platform in which its currency is integrated and usable. As of September 2018, there isn’t much information available on this project’s past accomplishments. Even though the project website states that the whitepaper release date was to take place in June 2018, the team has yet to provide a whitepaper. According to the project roadmap, the original creator of Safe Trade Coin (XSTC) abandoned the project back in 2017. The project website doesn’t list the exact start date of the project; however, Cryptoslate says that the project launched in November 2016. While many cryptocurrency projects have failed in the past, most have done so either after receiving funding or after unsuccessful ICOs where no capital was raised. Safe Trade Coin, on the other hand, appears to have no prior public or even private fundraising efforts. In Q1 2018, the project’s revival began. 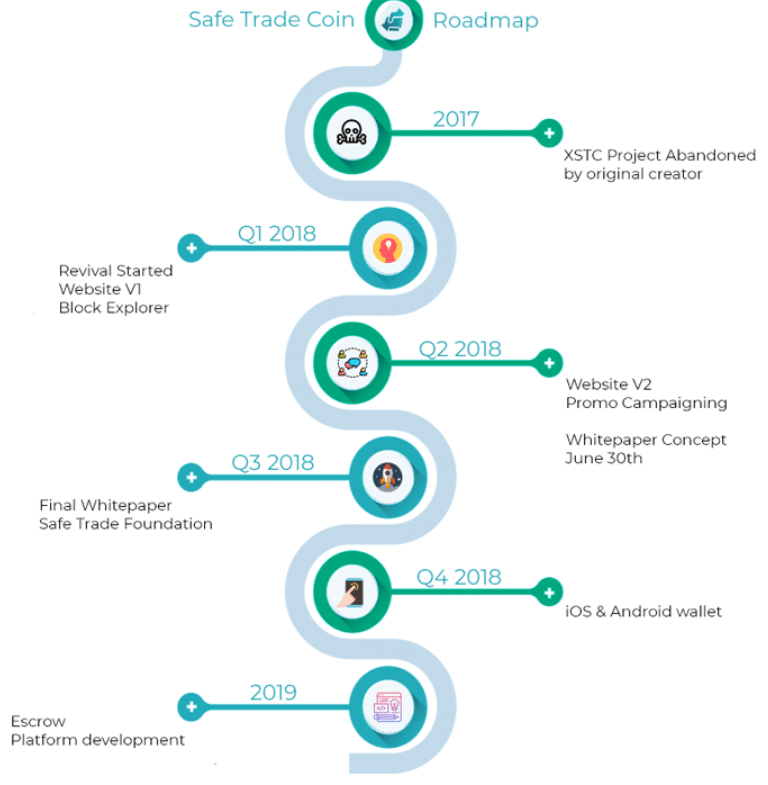 This included the launch of the first Safe Trade Coin website and block explorer. In Q2 2018, the project began a promotional campaign. This information and subsequent discussions can be found on the project’s Bitcointalk page. Safe Trade Coin utilizes a Proof-of-Stake consensus mechanism. What sets it apart from other coins utilizing PoS is its generous staking reward. All users can expect a 25% annual reward from staking. This could very well incentivize users to HODL this coin instead of trading it, possibly creating more stability in bear markets. However, the downside to this could be that users would rather just use XSTC as an investment asset, much like a blockchain bond, rather than use it for real-world P2P payments. It’s also important to note other details like confirmation for payments require only two blocks. In other cryptocurrencies, this number is typically higher. For instance, Bitcoin requires six blocks. Ethereum requires at least five. While this number can vary greatly, a higher number of required confirmations ensures that a transaction isn’t easily reversible. In essence, more confirmations usually equal better security. The circulating supply is 706,661,973 XSTC. The maximum supply is 840,000,000 XSTC. In other words, a little over 84% of the maximum supply is already in circulation. This is a positive sign compared to projects that either lack a maximum supply or those that have a small circulating supply compared to the maximum supply. Desktop wallets are available for both Windows and Linux operating systems. XSTC coin features can be found on the project website. Safe Trade Coin (XSTC) values its identity as a community-driven project. This means that members of the community (especially those with exceptional programming and designing skills) can contribute to the early stages of the project’s formation. The project website also states, “With an average transaction speed of 60 seconds XSTC has a solid position within the market. The transaction fees are relatively low and reasonable.” The main technical feature appears to be the creation of an escrow functionality. This will likely be a big component of the future Safe Trade Coin platform. Safe Trade Coin, like some other community-driven projects, doesn’t list core contributors on its website. However, it’s unclear who exactly is developing/contributing to the project and to what extent. The future roadmap doesn’t appear to be all that ambitious either. For example, near the end of Q3 2018, the whitepaper still isn’t listed on the project website. Additionally, the Safe Trade Foundation should be formed by now. Regardless if this organization has or hasn’t been created, there isn’t much information about its purpose. In Q4 2018, the iOS and Android wallets should be released. Finally, sometime in 2019, we should expect the escrow platform development to commence. As of September 2018, we have yet to see the regular updates or community interaction on par with what one would expect from a top cryptocurrency project. The XSTC roadmap doesn’t include many details about plans for upcoming updates. For those interested in purchasing Safe Trade Coin (XSTC), there is only one choice. As of September 2018, XSTC is only available at Coinexchange. Additionally, BTC is the only trading pair available on that exchange. Compared to most other cryptocurrencies, XSTC is lacking in exchange availability. The fact that Safe Trade Coin (XSTC) was once an abandoned project is not a good sign. However, the worse news is that the project doesn’t seem to demonstrate any signs of positive support in its second life. For example, there haven’t been any updates on the project’s Twitter since May 2018. There is some interaction on sites like Bitcointalk but even this is limited. Safe Trade Coin needs more frequent updates and community interaction to build a true community. This pop-appeared when visiting the Safe Trade Coin block explorer. Conclusion: Is Safe Coin Truly Safe? When it comes to cryptocurrencies, we have seen a number of exit scams and other crimes. So, is a cryptocurrency called Safe Coin using the word ‘safe’ as a way to lure unsuspecting investors? The answer appears to be no. Still, this cryptocurrency’s lack of progress on technical updates and marketing efforts should be concerning. Additionally, it appears that the contributors are late on delivering key updates mentioned in the roadmap. Once the project releases the whitepaper and mobile wallets, we’ll have a better idea of the capabilities of this project and its potential role in the cryptocurrency landscape. For now, we’re still waiting for the answers to these questions.